Cook the pasta as directed on the package instructions. While the pasta is cooking, heat olive oil in a large skillet (I use a 12" skillet) over medium heat and add a cup of breadcrumbs with Italian seasoning. Cook until the breadcrumbs are nice and toasty. Remove from skillet and set aside until needed. Increase mid-high heat and melt the butter in the skillet. Season the cubed chicken with kosher salt and freshly cracked black pepper and add to the skillet. Allow to sear, undisturbed, for 3 minutes. When the chicken cubes have a good sear on one side, flip them over to sear the other side and add the freshly minced garlic with ½ cup of cubed ham. Cook, stirring the chicken and ham mixture an additional 3 minutes until golden brown. Check the chicken for doneness. It should be done, but if the chicken is cut on the large side, be sure to continue to cook until it is cooked through. Add Holland House® White Cooking Wine and scrape up any browned bits from the bottom of the pan. There is flavor in that brown to enhance the flavor of your dish, and deglazing is a great opportunity to get any stuck-on pieces off for easier cleaning! Bring the wine to a boil and reduce it down by half. This should only take about 5 minutes. Heat the heavy whipping cream in a microwave safe dish about 30 seconds to a minute just to get it hot enough to dissolve the cornstarch. Add the cornstarch. Stir to dissolve the cornstarch and pour this mixture into the skillet. Cook until the sauce is thick and creamy, about 5 minutes. When the sauce is thickened, remove from heat and add Gruyere cheese, until cheese is melted into the sauce. Add pasta and stir to combine. Top with reserved toasted breadcrumbs and put under broiler for about 2 minutes, until the top is nicely toasted. 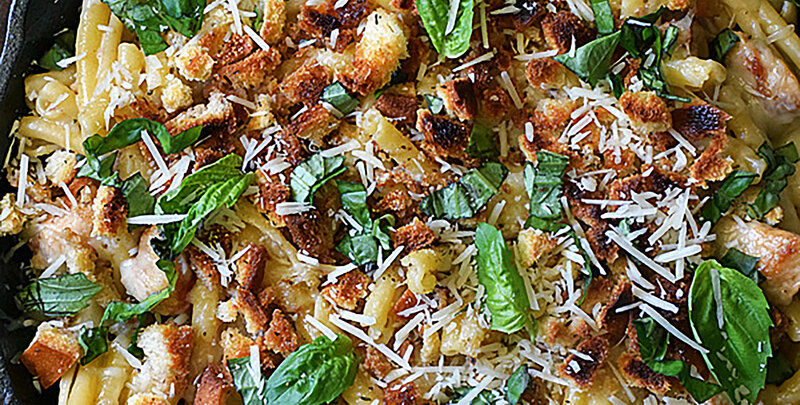 Garnish with shredded parmesan cheese and fresh basil leaves. Enjoy! Bold Boost #41: Pouring ½ cup of Holland House® Red Cooking Wine into your favorite chili recipe gives you an easy addition of robust flavor.